Quinoa is an excellent alternative to carb-dense white rice. These grains cook quickly, usually in less than 15 minutes. You can tell that your quinoa is cooked when “translucent and white germ on each grain has partially separated like white tail”, notes the book ‘Healing Foods’. It is upto you how mushy or grainy you want to keep your quinoa. It is advised not to overcook the quinoa as you may lose out on its nutritional benefits. High-end restaurants around the country are experimenting with the wonder grain and coming up with innovative and delicious preparations. From salads, smoothie bowls to desserts, quinoa is everywhere. Did you know quinoa tastes equally well in our desi dishes too? 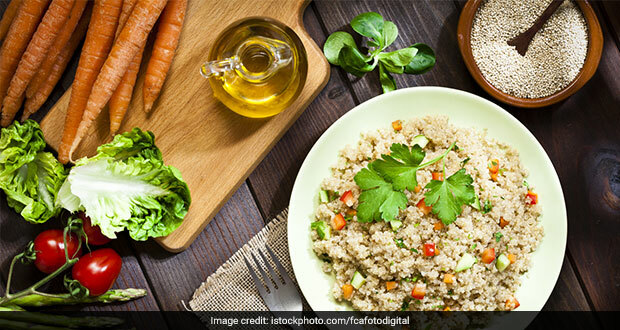 Here are some delicious desi ways in which you can cook quinoa. Soft and delectable quinoa tikki makes for an ideal evening snack. The gluten-free grain mingles very well with other flavours. This delicious Quinoa, Couscous and Beetroot Tikki is a colourful and exciting treat that even your kids would not refuse. The healthy snack also packs fibre-rich goodness of spinach and oats. Think sevaiyan and you would imagine all things festive and indulgent. But just like tikki, you can give a healthy spin to your sevaiyan too with this delectable Orange Quinoa Sevaiyan. Soft vermicelli noodles, mixed with the goodness of quinoa, orange juice, dried figs, jaggery, walnuts and melon seeds, this yummy dessert is a diet-friendly cheat meal you can gift yourself after a week full of being good. Weight loss: Give a healthy spin to your sevaiyan too with this delectable Orange Quinoa Sevaiyan. As we mentioned earlier, quinoa is an excellent substitute to rice. And if you are a rice fan and thinking how you are going to get your biryani? Fret not. This yummy chicken quinoa biryani is the protein-fix you have been looking for! Try these yummy recipes and let us know any new interesting recipes that you have tried at home and loved.